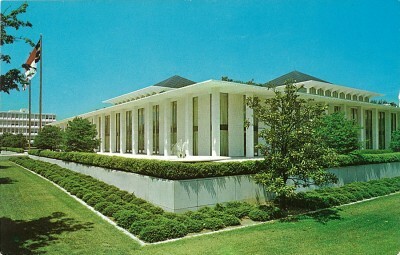 The New Legislative Building, Raleigh, N.C. This week for Flashback Friday we feature a beautiful ‘photochrome’ postcard depicting North Carolina’s Legislative Building, probably Raleigh’s most recognizable modernist structure. Photochromes such as this have been the standard for American postcard production since the 1950s. The New Legislative Building. 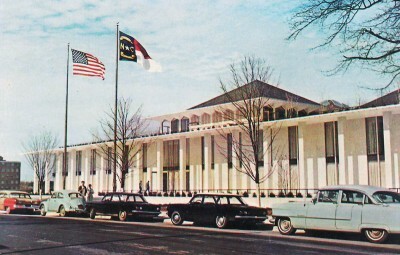 The home of the North Carolina General Assembly, designed by Edward Durell Stone of New York, in association with Holloway-Reeves of Raleigh, is unique in that it accommodates all legislative functions and is devoted solely to the legislative branch of the State Government. Designed in 1960, and built new in 1963, the building nowadays is so architecturally classic that the photo seen in the postcard looks like it could have been taken yesterday. The photo actually dates from 1968 or so, as evidenced by the presence of the state administration building in the background. 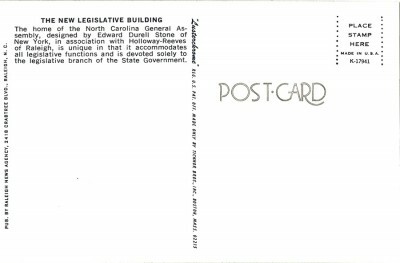 The postcard view seen below dates from a few years earlier than our feature card, and shows the Legislative Building with certain ‘date markers’ lined up along Jones St.
As noted on the back of this week’s postcard, the iconic Legislative Building was designed by the internationally-renowned American architect Edward Durell Stone , in association with the Raleigh firm of Holloway & Reeves. 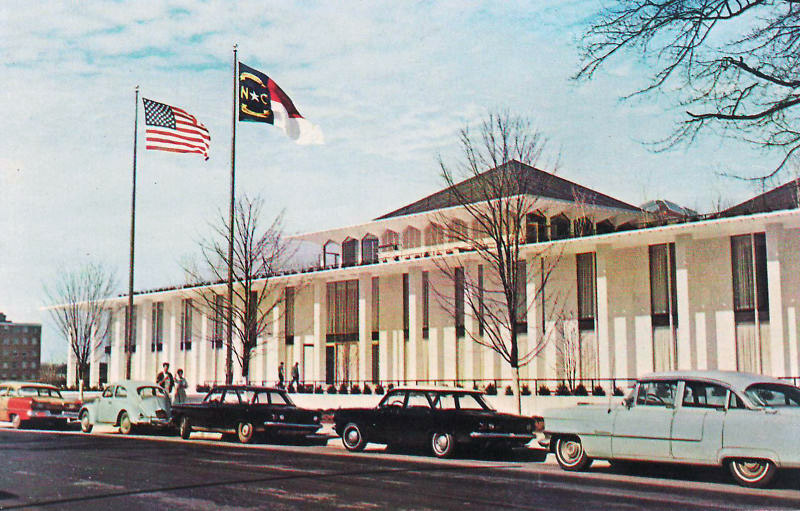 Goodnight Raleigh documented the fascinating history of North Carolina’s Legislative Building in an earlier feature post. Our Flashback Friday postcard this week was published by Tichnor Brothers of Cambridge, MA. A major publisher and printer of a wide variety of postcards types. 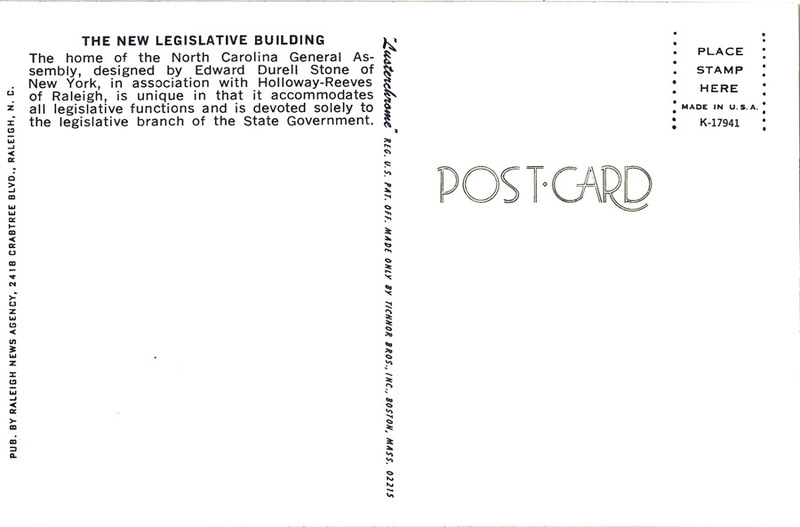 Their view-cards were produced on a national level. Their photochromes went under the trade name Lusterchrome. They also produced an early Tichnor Gloss series in offset lithography that was so heavily retouched they floated somewhere between being artist drawn and being a photograph. The company was sold in 1987 to Paper Majic. “Flashback Friday” is a weekly feature of , Goodnight Raleigh! in which we showcase vintage postcards depicting our historic capital city. We hope you enjoy this week end treat! Triangle Modernist Houses has a complete list of Stone’s Modernist houses at http://www.trianglemodernisthouses.com/stone.htm. Those Corvairs out in front of the building in the last picture are looking pretty solid! Regardless of how you feel about how it looks on the outside, it hasn’t aged well on the inside. I don’t think it was designed to handle the traffic it now gets. Another problem with the interior of the building is the dreadful neo-federalist renovation of the Senate Chamber a few years ago, complete with horrifically overdone crown molding that looks like something out of the $1,000,000+ category on the Cary Parade of Homes. During the early 1920s, my grandparents lived in one of the homes that were demolished to build this. I’d love to see a picture of those.